Super Smash Bros Ultimate is easily the best entry in the series. I figured I’d get right to the point for this review, seeing how I used up all my best anecdotal-intro material on a previous piece analyzing the Smash Bros series. And I’m sure it seems obvious that the resident Nintendo-boy would sing the praises of another tightly made Smash Bros; but after watching each Direct and playing it twice at demo events, it genuinely impresses me just how much is going on in this game. To say this is, “the Smash Bros you know and love,” is both accurate and a bit misleading. Smash Bros’ gameplay was so perfectly constructed that there has been little need to alter it in any drastic way. So while the mechanics of combat still remain the same, little touches like the return of directional dodging and revamped physics create a game that feels both like a combination of the best parts of each previous entry, and something completely new. Aside from the standard Smash, there’s the much anticipated “World of Light,” which serves as the story mode in Smash Bros Ultimate. Unlike Brawl’s “Subspace Emissary,” World of Light is less a succession of fights, capped off by over-the-top cutscenes—actually, it’s quite disappointing how few cutscenes are actually in the story mode—and instead is more a collection of combat challenges with some light RPG elements. Players travel across a wide map, challenging the “Spirits,” of characters from the various video game series’ incorporated in Super Smash Bros Ultimate. Spirits are represented by fighters from the main roster and the amount of thought and creativity that went into creating these challenges is incredible. A fight against Dreambert from Mario and Luigi: Dream Team had me facing Luigi, the real star of that game; in Magicant, a world of dreams, where touching the floor made me fall asleep. The spirit of Mechakoopa, the explosive wind-up machine by the Koopa Clan, had me facing a bunch of tiny Bowsers each equipped with bombs. Every fight consistently had me impressed with how well they connected each Spirit to the fighter that best represented them, and a challenge that related to them. But it’s not simply a collection of challenges. After a Spirit is defeated, players then attain that Spirit which can be equipped for buffs in proceeding fights. These come in both main Spirits, which have either a Strength, Defence, or Technical attribute that can be countered, much like Fire Emblem’s weapon triangle; and sub-Spirits that can offer added bonuses in fights. But what would a review of Smash Bros Ultimate be without discussing the main event: the roster. If you’ve paid even a nominal amount of attention to the game’s advertising, then you know the deal. EVERYONE.IS.HERE. It seems so obvious a concept that characters that appeared in previous entries of the series would show up in future ones, but with rights disputes, hardware limitations, and character redundancies, it makes some amount of sense that certain characters were missing from Smash 4. 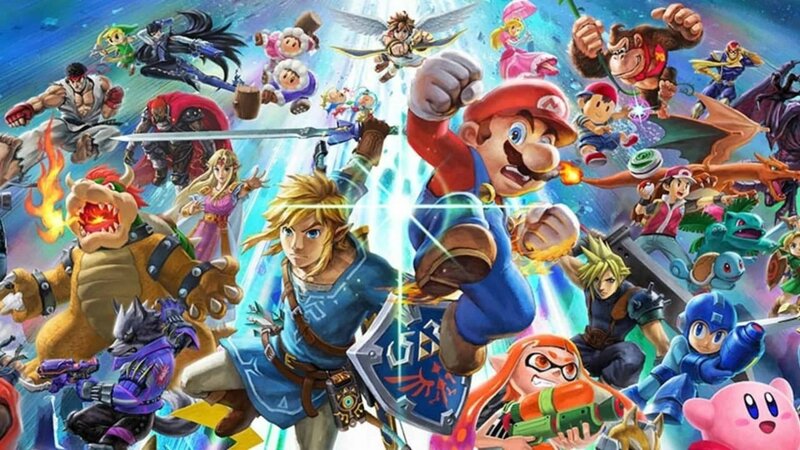 But all that is in the past; and Smash Bros Ultimate has the most incredible roster in the series’ history. 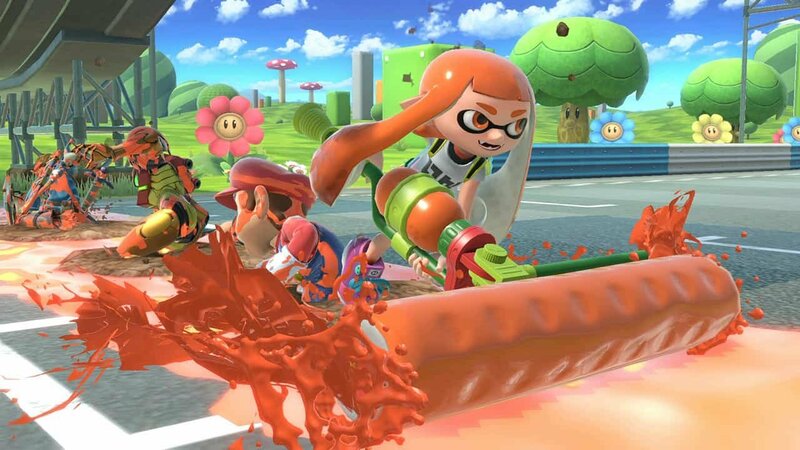 Of course, there are the newcomers; Inkling is quick and tricky, but needs to be played carefully as she relies heavily on her Ink to use her specials. 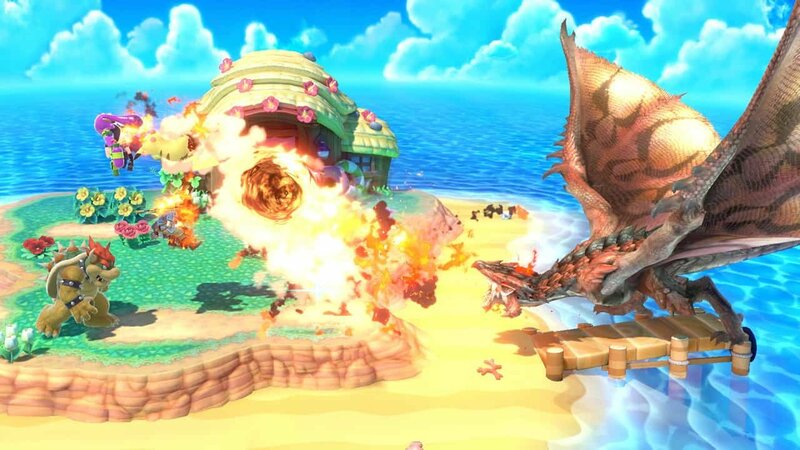 Ridley is as fearsome in Smash Bros as he is in Metroid; his attacks are brutally animated from his side-B where he drags opponents along the ground, to his down-B which delivers a devastating tail stab. King K.Rool is cartoonishly animated despite being a very hard hitter, utilizing a combination of attacks from the Donkey Kong Country series of games, like his iconic crown throw, or his pirate blunderbuss. Incineroar moves quick and hits hard, with each move detailing his Lucha Libre influence. I particularly like how he poses after successful blow, much like a Rudos riling up the crowd. And of course, there is the star of the show; the character I’ve been saying should have been in Smash since Brawl: Simon Belmont. Simon is a bit tricky to use; true to his NES origins, his attacks are a bit delayed and his recovery is a bit weak, but his variety of items and incredible reach make him very a versatile fighter. I still take a bit of umbrage with the “Echo Fighters.” I was particularly annoyed with how many clone-characters took up Smash 4’s roster, and while I appreciate the attempt to put a name on this and create characters who are slightly different than their original counterpart, it still rings somewhat hollow. Realistically, there’s no tangible difference between Daisy and Peach, or Samus and Dark Samus, or Richter and Simon. In the audio/visual department, Smash Bros Ultimate is breathtaking, both in handheld and in docked mode. Maps are intricately designed and look amazing in HD; characters are immensely detailed—from their character design to their movements and attack animations, every character feels unique to their origins. But it’s not just the incredible level of apparent design that sets Ultimate apart. The number of little details like Ness’ PK attacks utilizing details from the attack animations in Earthbound on SNES; or how Simon stands posed like he did in the NES Castlevania, showcase a real love and understanding for these characters and the games they came from. Naturally, the sound design is equally as inspired. Character voices all sound great, and the way certain characters blend updated sounds with classic 8-bit adds a lot to the nostalgia of these characters—I was personally a big fan of how Simon’s whip makes the sound from the NES Castlevania for certain attacks. But it isn’t just top notch sound effects, the incredible amount of music available for each stage adds so much variety in shaping the atmosphere of battles. From classic tunes brought over from previous entries, to beautifully orchestrated originals and remixes created for Ultimate, there is so much to enjoy that they made creating playlists and listening to the music an actual feature within the game. And of course, with the Switch comes the portable nature of Smash Bros and it couldn’t be more perfect. I was actually a big fan of Smash 4 on the 3DS, so much so that I spent more time playing it than it’s Wii U counterpart. The simple yet nuanced design of Smash Bros is perfectly tailored for both newbies and pros alike, and that design makes it perfectly suited to a system like the Switch where you can take it anywhere and easily hand someone a Joy-Con and jump right into it. Surprisingly, playing in hand-held with a single joy-Con is a lot better than I thought it would be, and the game itself loads quickly and is so easy to jump into, that I had no problem squeezing in a few rounds with some coworkers during lunch-breaks. Lastly, there is of course the much anticipated Online feature of Smash Bros Ultimate. Nintendo’s previous attempts to bring Smash Bros into the modern-era with Online play have been mixed at best. Brawl was an unacceptable mess of wait-times, unbearable lag, and frequent game crashes from host-players dropping out after losing early. Smash 4 fared slightly better, with a simplified matchmaking system, but still suffering from some hit-or-miss connections. 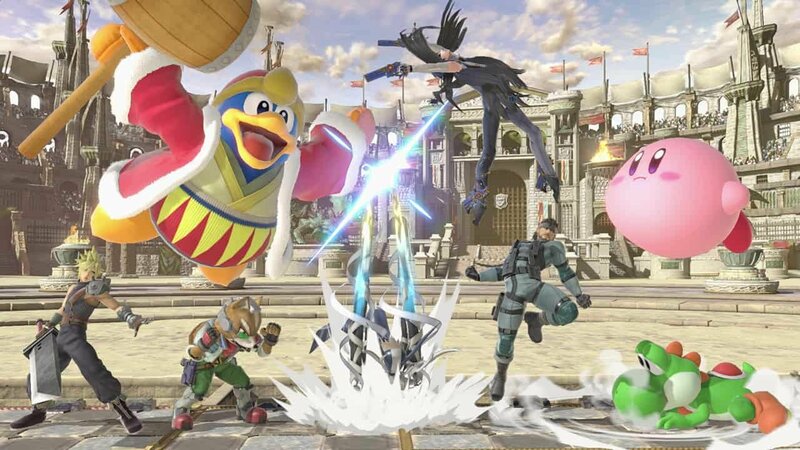 I’m happy to say, with Smash Bros Ultimate, Nintendo may have finally gotten how to bring Smash Bros online. To start, the matchmaking system is no longer restricted to “For Fun” or “For Glory,” but fully customizable battles to suit whatever you’re in the mood for. 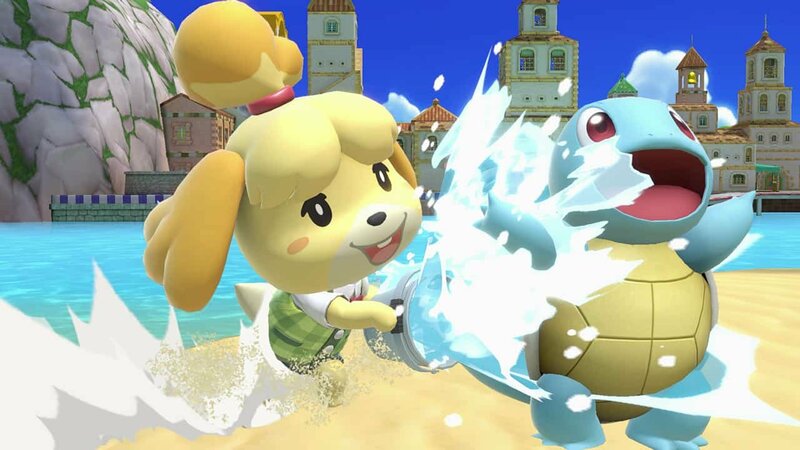 Players can choose between “Quickplay,” which allows them to hop into a game, with the ability to turn on “Preferred Rules”—setting the format from group Smash to 1-on-1, timed or stock, stage form, or choosing items. While this doesn’t guarantee every fight will play out in your preferred way, it does try to prioritize finding matches with similar rules. Also, there are Battle Arenas, where players can create rooms for other fighters to join and participate in. This mode has a bit more flair and community settings, as players are placed in a lobby where they can either spectate, or get in line if a battle already taking place. The range of rules to be set are a lot more robust than Quickplay, allowing players to set a skill level, format, and even player rotation. Also, while playing in Battle Arenas, players can chat with each other via the Nintendo Mobile App. 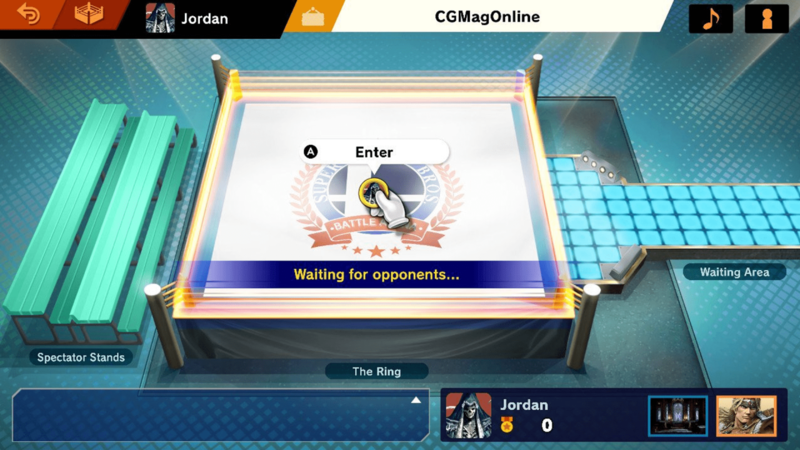 Last but not least, Smash Bros Ultimate includes a “Background Matchmaking” mode, where players are able to play other modes while they wait for an online battle to be found. Honestly, I was genuinely worried that Nintendo might drop the ball again with Smash Bros Ultimate’s online, considering their less than stellar track record with online play—especially now that Nintendo Online is a paid service. But Nintendo really seemed to bring their A-game here; of all the games I played, every one connected fast and had little to no lag or connection issues. Smash Bros Ultimate seems to be prioritizing player freedom which I imagine will play very well with the professional Smash community. However, it isn’t a completely perfect experience. For starters, there is no way to change characters in Quickplay without quitting back to the lobby; so if you wanted to challenge a worthwhile opponent to a rematch and use a character you might be better with, you’re out of luck. Also—and this is owed more to Nintendo’s whole system than Smash Ultimate itself—but there’s no way to conveniently invite friends to games, or join Arenas they might be in; even the Nintendo App doesn’t help much. While these are annoyances, they really don’t detract from the online in significant ways, and hopefully Nintendo will resolve these issues with a later patch. I’ll be honest, when I first saw the initial teaser for Smash Bros Ultimate, I never believed it would be a from-the-ground-up new game. Nintendo had been seeing success re-releasing Wii U games on Switch, adding new content to justify the second purchase, and I assumed they would do the same—after all, Smash 4 was about as perfect as the series could be, and a re-release with some additional characters and stages could’ve been enough for the Switch. But Sakurai and the whole Smash Bros team really put a lot of love and care into the series, and it really shows. Seriously, the sheer amount of content to be found within this game is staggering. 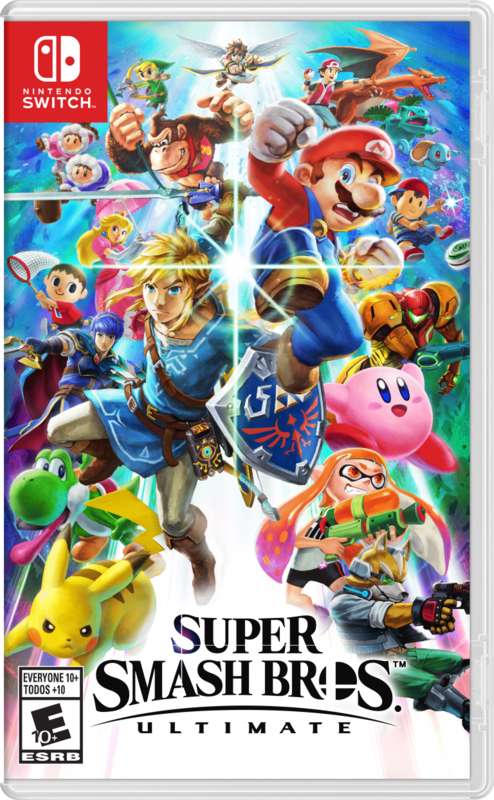 From the roster to the stages; the music, the amount of Spirits, game modes, and so much more Smash Bros Ultimate is the definitive Smash Bros experience and a must own for fans, newcomers, and Switch owners alike.